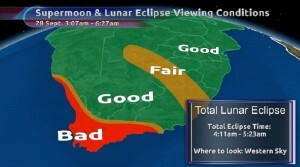 CAPE TOWN – More than half the world is set to witness a rare astronomical event in on Sunday evening and during in the early morning hours of Monday. The event is so rare it last happened three decades ago and will only happen again in 2033. We get to see a super moon when the moon is closest to earth and it appears to be about 14% bigger and 30% brighter. A lunar eclipse occurs when the moon moves into the earth’s shadow with the earth between the sun and the moon. The earth’s shadow has two regions. A lighter and outer one called the penumbra and a central and darker one called the umbra. 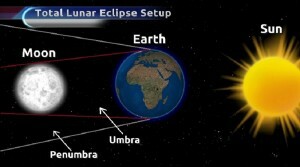 The penumbra causes a slight dimming of the moon. It is when the moon moves completely into the umbra region of the earth’s shadow that total eclipse is achieved and the moon turns red, earning the eclipse the term blood-moon lunar eclipse. This September’s total eclipse will be the last of four blood-moon lunar eclipses the world has seen, the other three occurred in April 2014, October 2014 and April 2015. The eclipse will be visible across parts of the Americas on the evening of Sunday the 27th and in parts of Europe, Asia and Africa during dawn on Monday the 28th. 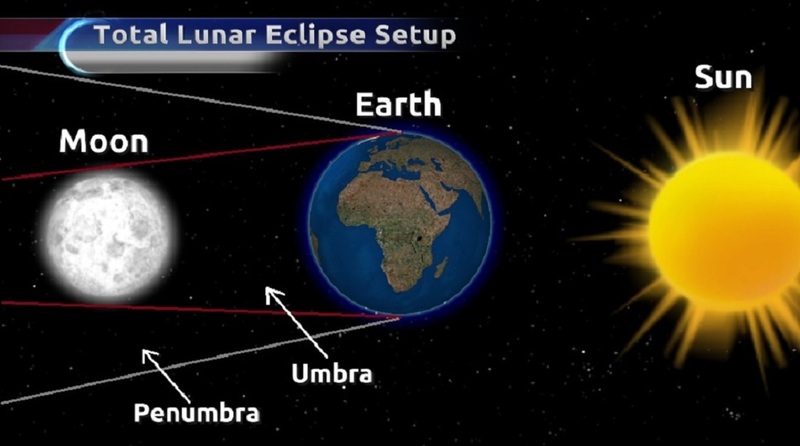 In South Africa the total lunar eclipse will be visible for slightly more than an hour from about 4:11am until about 5:23am right across the country. However, as with any other celestial observations, viewing the eclipse will also depend on the weather. The eNCA weather department has checked and double checked sky conditions across South Africa for the morning of Monday 28 September. 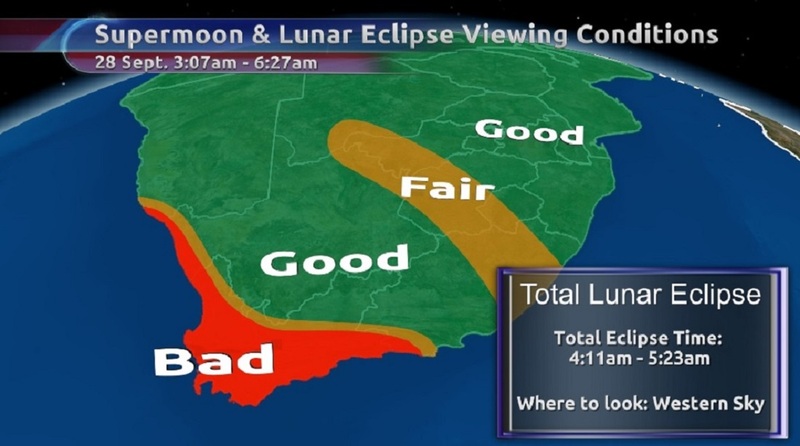 Cloudy skies forecast for the west coast means ‘moon watchers’ in the south western areas of the Western Cape and on the south coast may not have a good sight of the eclipse. A few patches of cloud could hide the moon a bit in parts of the North West, Free State and the eastern areas of the Eastern Cape. The rest of South Africa will have cloud free skies and a clear view of the eclipse. The map below highlights the different eclipse viewing conditions for different parts of the country. Three dead, two in critical condition following collision between Randfontein and Ventersdorp.